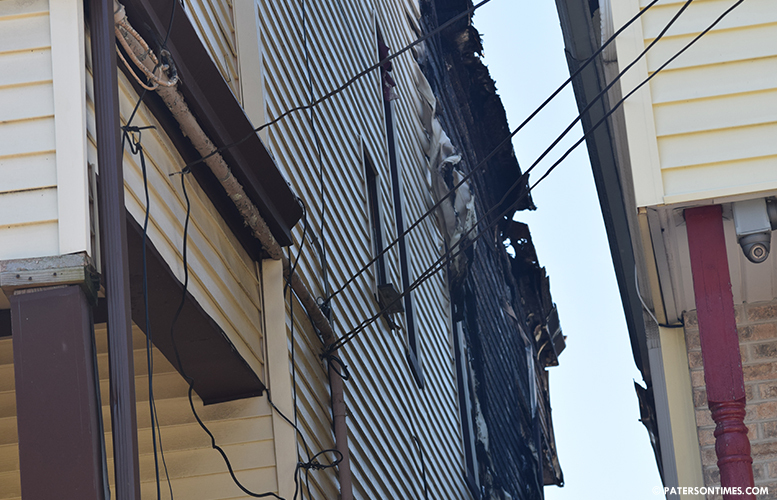 Twenty-eight people were displaced from their homes on Ellison Street on Thursday afternoon due to a second-alarm blaze that damaged two houses. Fire started on the third floor of 406 Ellison Street, said deputy fire chief Pablo Del Valle. Firefighters began battling the blaze at the rear of the three-family building at about 3:16 p.m. The flames were under control at 5:10 p.m.
A second building, 402 Ellison Street, sustained damage from the blaze. The deputy chief said there were no firefighter or civilian injuries. “I’m happy no one got hurt. The house you can replace. You can’t replace a body,” said a man, who declined to provide his name, on Friday morning. He said he lived on the second floor of 406 Ellison Street. He was waiting to get back inside the building to retrieve some of his belongings. “We got some stuff out,” he said. The cause of the fire remains under investigation, said Del Valle. The American Red Cross is providing assistance to the five families displaced from the two homes.